Espresso’s time-saving features make bookings fast and efficient, so you can better serve your clients and your bottom line. It’s no wonder it’s the industry’s favorite reservation system. 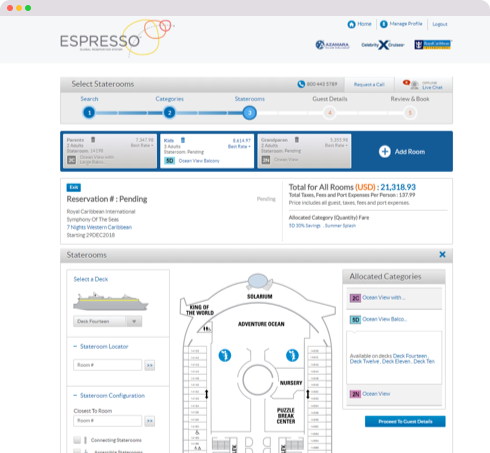 Espresso makes it easier than ever to customize your clients’ experiences. Personalize reservations on your terms! Boost engagement like never before. 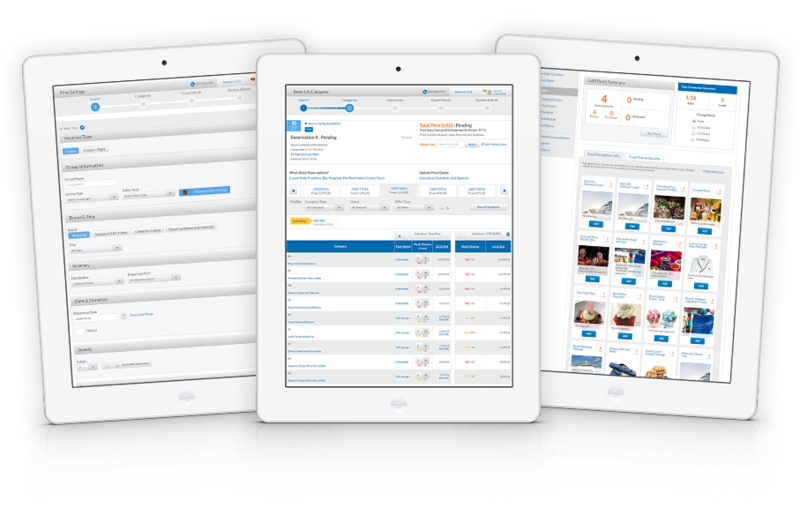 With Headquarter Groups, your members can view and book into your groups with just a few clicks. Now you can see everything in one place. Single View lets you compare pricing and availability across your existing group with group prevailing rates and individual best rates side by side. Rewarding your clients is easier than ever. Now you can redeem, share and even purchase Group Amenity Plus points through Espresso to enhance your client’s vacation. Create the right booking every time. With Guest Profile and Offers, you can display a customer’s history, recent promotions sent to them, last cruise taken and accommodation preferences. Book your next group with maximum efficiency. 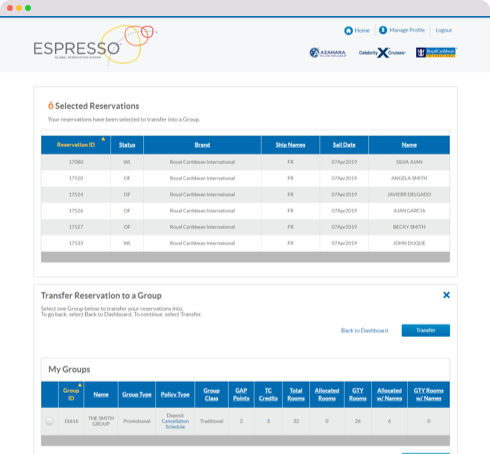 Espresso’s updated interface allows you to reserve and manage all your groups with fewer steps and less clicks. 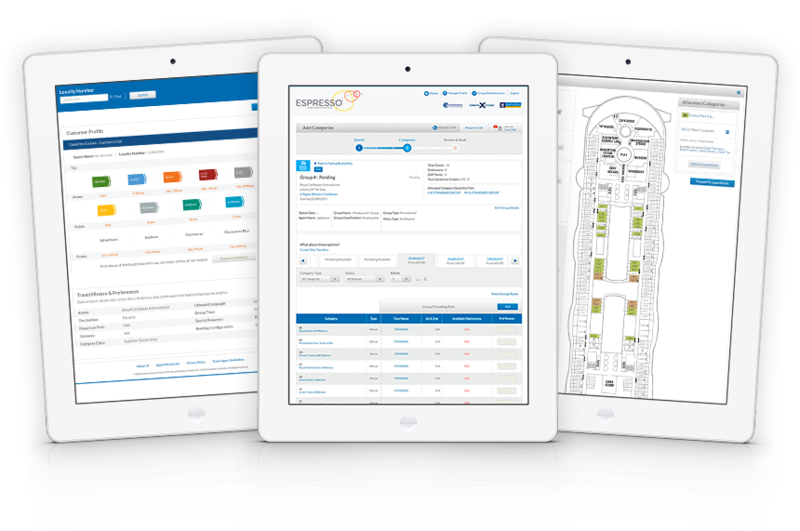 Visualize exact stateroom locations for easy bookings. Highlight available staterooms by connecting, accessible or closest to. You can also view staterooms details with photos and layouts.